The president claims, with no evidence, that local officials want to use recovery money to pay down the U.S. territory’s sizeable debt. The unfounded claims about federal funds being misappropriated come from Trump’s misreading of an October Wall Street Journal article, multiple unnamed sources told Axios‘ Jonathan Swan. A day after the Journal report was published, Trump falsely alleged on Twitter that the island’s “inept politicians are trying to use the massive and ridiculously high amounts of hurricane/disaster funding” to pay off Puerto Rico’s substantial debt. Some members of Congress and others, meanwhile, have called for canceling the island’s debt as a form of relief, noting that decades of U.S. policy that produced the debt crisis, and the federally-mandated austerity plan crafted in response to it is cruel, particularly after the devastation left by the hurricane. Even though Trump can’t take back money Congress already has set aside for the commonwealth, he could refuse to sign off on future spending bills, which could notably impact the island’s already sluggish and widely criticized recovery process. 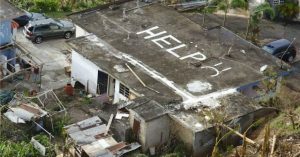 So far, Federal Emergency Management Agency (FEMA) reports that more than $6 billion has been spent on Hurricane Maria relief, and the agency expects such spending to exceed $55 billion.